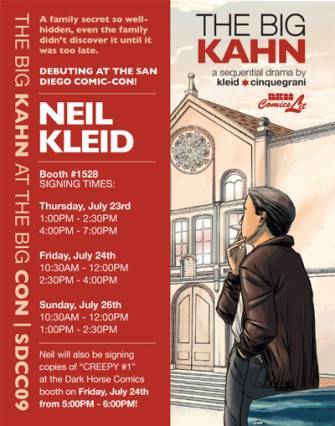 Just wanted to drop a line to let you know that I'll be attending this year's San Diego Comic Con -- I have a new graphic novel debuting at the show from NBM Publishing entitled THE BIG KAHN, and am excited to see all of my friends and colleagues, immerse myself in comics and pop culture and simply enjoy being part of this industry. Though I'm sure our paths will cross at some point during the show, I thought I'd make it easier by providing my signing schedule and I look forward to catching up with you at some point. Have a great weekend and see you in a week!